Bubi Bottle is the water bottle combined with both durability and fashion. The 22 oz (425 mL) is the hydration essential for fitness workouts, outdoor adventures or long work days. Our 22 oz is the fan favorite for camping gear, gym water bottle, or for your daily water bottle. 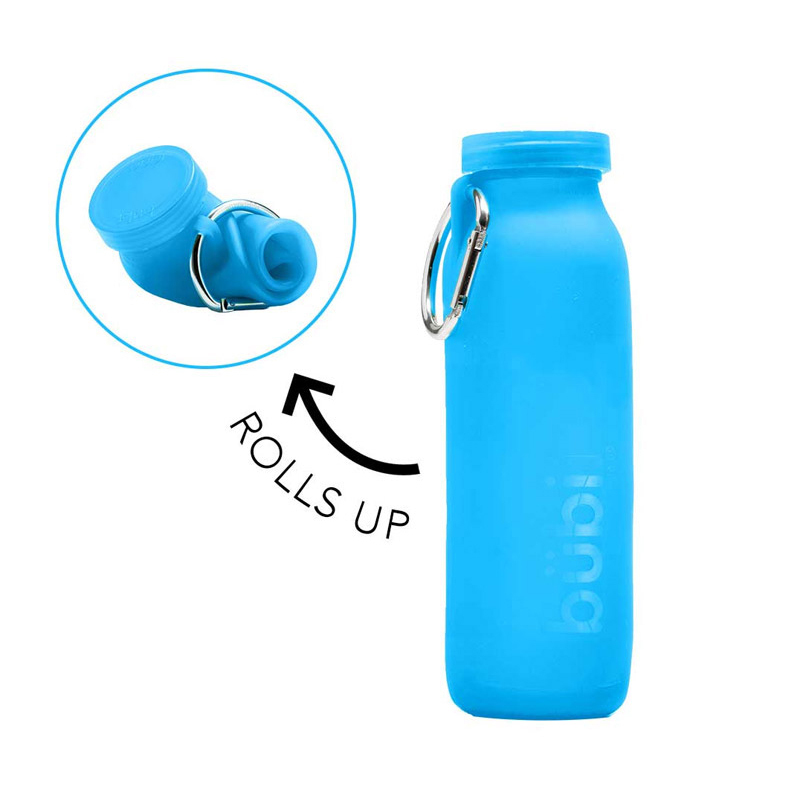 This BPA Free water bottle rolls up to fit into your purse or backpack. It collapses into your pocket and made with puncture-resistant silicone (alligator approved)! 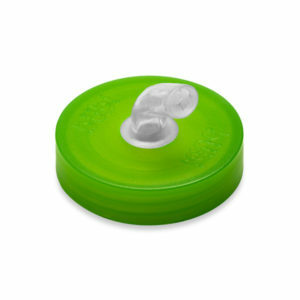 Bubi is easy to clean: flip it inside out to get all the junk out or throw it in the dishwasher (on the bottom rack too!) It is ready for your average day or biggest adventure yet. I love my bubi it’s great for college for carring around a school bag it’s great to have a water bottle that doesn’t take up much space. I love the convenience of this water bottle! I can take it anywhere I go. It doesn’t take up too much space in my bag, so it’s easy to get through airport security and fill it up once you get out. I love that it’s great for both hot and cold beverages too! I received my BubiBottle as a gift and I absolutely love the versatility! My toddler quickly took it to use for himself because he loved the soft squishy texture. I love it because it’s easy to clean and perfect for on the go! This is the perfect color for my coffee! I actually have been using the same one (1st gen) for 2 years now. I popped the center of the retainer out (per the instructions on the bźbi YouTube site) to make it easier to pour hot coffee into and use the same sports cap. Sure, it gets coffee stained after a while, but I just turn it inside-out (also per YouTube) and it comes right out! Your products are awesome Craig! I love my Bubi Bottle! The sport cap is wonderful. You won’t ever have to worry about spills again. Which is great, since I drink a lot of water, and my water is right next to my computer, and…I’m clumsy! LOL! Also, Bubi’s design makes it very easy to just roll it up and take when travelling. No more spending $4 on a bottle of water! Bubi’s great! Great bottle. Amazing customer service. The owner cares very much about his customers. Slightly “wobbly” but I’m happy with the purchase. I just received a 22-ounce (blue) and a 14-ounce (red) Bubi Bottle, along with Sports Caps and a Bubi Hatch for each. The quality and well-thought-out design is impressive indeed. The bottles are comfortable to hold; no leakng whatsoever; a slght silicone taste in my water was present until I filled the bottles with hot strong lemon water and subsequently with hot camomile tea to neutralize residual flavors. I have experimented by microwave heating water in the bottle to make tea and was happy with the result. The Bubi Hatches are beautifully constructed and act as great insulators against a frozen or very hot bottle. 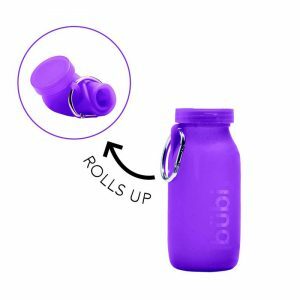 I love the carabiner to secure the rolled up bottle – nothing to break or lose. Researching other competitors bottles revealed that they are secured in ways which are likely to result in broken plastic clips or stretchy bands. The caabiner is a far better idea. My only wish is that a cap could be attached to the bottle to avoid dropping it onto dirty surfaces or risk being lost but I understand that future designs are currently being considered regarding the caps – can’t wait to see what becomes available. After limited but very enthusiatic experience and after a lot of comparison and review shopping, I am very happy to recommend all the Bubi Bottle products. You won’t regret your puchase. Took my newly purchased Bubi bottle to Bonaire. Loved it, used it ever moment. Very handy, use it everyday. Good customer service too. Love the bottle. This is my second purchase of this product. Finally learned how to properly clean the bottle and am thrilled. Down side: the clip is awful+ broke after 2weeks!!! I finally found the perfect bottle! I love the bubi bottle because you can heat water, keep cold water, easy to clean and carry it everywhere. The material is great so soft and light weight. It’s a must have bottle! I recently went camping with my boyfriend, my first time camping! I brought along my bubi bottle and used it to boil water for tea, soup, and coffee. I was so surprised and recommend all campers to buy the bubi bottle. I purchased two of the Pacific Blue (my favorite color) 22 oz water bottles, one for my 12 year old daughter and one for myself. I needed a water bottle for work, requiring a bottle with a lid and that does not leak if knocked over. My daughter wanted one for school that can be tossed into her backpack without leaking onto school work and books. I read about this bottle on Frugal Reddit and decided to give it a try, after trying a couple other brands of bottles that leaked and/or tasted like metal. She and I both rate this 5/5 stars. The bottles are a beautiful blue that we both love! These are fun to use because they are squishy, which sounds silly but makes them better than just a normal, boring bottle that does the same job. 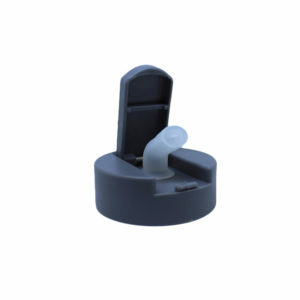 The mouth piece has smaller holes for drinking, which is a huge plus for me! I have never not spilled water on myself from a wide mouth bottle. These are a perfect size for drinking. Water doesn’t gush out nor come too slow when needing to drink fast during a quick exercise break. This was actually my favorite reason for having this bottle. We recently took a trip to Georgia, and took these bottles through security to refill and use on the plane. They roll up small and can be shoved and squished into any pocket in our carry-on bags. Super easy to use. The clips allowed it to hang on the sides of our bags when filled with water, but they could have easily been tossed back into our bags since they don’t leak. My last favorite part about the bottle is that it makes water taste normal. The previous bottle I had tried from a different company (which leaked all over my backseat in my car) left the water tasting weird, maybe a metallic taste? I can’t quite describe it. This bottle leaves the water with a very normal, fresh taste. No change in taste at all! So far they have been easy to clean. I have put them in the dishwasher once, but usually wash them in the sink so I can use it right away instead of waiting for the dishwasher. My daughter has not had any complaints, which for an almost teenager is probably a good thing. So overall, wonderful bottles! I recommend for anybody! There is nothing that could be done to make them better! I love the 1st gen bottles we have three little kids and the fact you can put cold and hot drink in the same cup so i dont have to have a bunch of cups in the house is amazing. I LOVE my Bubi bottle, and tell pretty much anyone who asks about it when they see me take it out (which happens a lot). The light weight, collapsible, easy-to-clean and non-BPA features make this hands-down the best water bottle I could ask for. As a New Yorker who is always on the go, this bottle keeps me hydrated without burdening my wallet or my shoulders (like heavier bottles do). My only complaint with the 1st-generation bottle I have is that little particles tend to cling to it, but from what I hear they have fixed that with the 2nd-gen bottles. The one time I had to call customer service about a mail order question, I actually spoke to the owner/founder directly (at 11 pm!). He told me the whole story of Bubi’s founding and incubation of the idea at coffeeshops in NYC. His passion showed through, and was infectious. Bubi is, to me, not just a superior product I can get behind but a human company that represents what we look for in business: good people trying to meet the needs of consumers with quality products and customer service. I can’t say enough good things about Bubi bottles! These bottles are good for so many reasons. Besides being free of unhealthy materials, they are great for travel. When they are empty, they just roll up and take up very little space. They impart no flavor or odor. The attached carabiner can hook onto a purse strap, a belt loop, or other bag. 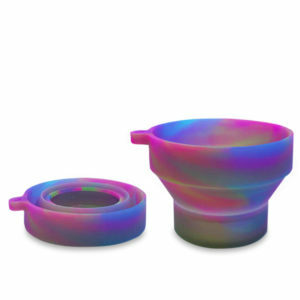 It won’t break if it freezes, and although I will never try boiling water in it, for campers that might come in handy. This company is also very customer friendly. I really like the new version that I ordered this year for gifts; the sport top attachment is a great improvement. Make sure to order that too. Easily THE BEST re-usable water bottle I’ve ever had the pleasure of owning (and I’ve gone through tons of others). It’s stylish, convenient/practical on many levels, and has surpassed all expectations. Hell of a conversation starter too. Do yourself a favor, and get a pair of silicone Bubis. The ladies love ’em, and you will too! What a terrific innovation! With the Bubi Bottle, I can have water wherever I go and don’t have to throw away a plastic bottle to do so. I love how it rolls up and can be tucked into any bag — big or small. The Bubi Bottle has been a game changer for me Thank you! Love my Bubi!! This is my 3rd bottle now it’s the best bottle I’ve ever had. I can go straight from the freezer to the microwave (minus the carabinier). I love taking a frozen bottle to the beach, the water stays cold much longer than other bottles.